then crashed all my hopes down into millions of pieces. Plus there's a better game out there. It's kind of annoying how in the elevator room everything is wiggling. How was there 175 stars? Yay! I beat the game. Toodles Team you've done it again. This would have to be one of the best fan-games I've ever seen! I hope to see more like this in the near future. It's like that in Wario Ware games. This game is pure superb. Very good Game !! You should continue with more minigames etc...!! I was using an emulator to rip those and there was a cheat to give you 175 stars. I though it would be funny to use that for the game. It doesn't matter if it's over, I just wait until the evaluation version button flashes up, great game Toodles Team! This is almost as great as the real thing! I never played a Wario Ware game, and this game is cool! Good job, Toodles Team! All the sounds and music is from WarioWare:Smooth Moves,right? download and install winzip10.0 and you time is ilimity.a have winzip10.0 and my free trial is over and is continue to work to open a zipfile and other.you can play the game now. 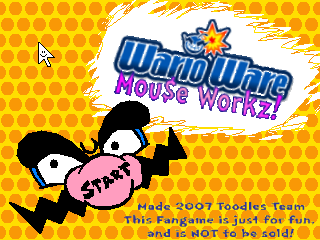 Kind-a like what i'm gonna make exept its called warioware clicked. I don't get it. The games go for like 5 seconds then I go back. That's how WarioWare games work. You have to accomplish some action with the mouse before the game ends, like dropping a boulder on a seesaw, or hitting barrels with a hammer. Hey I'm back! Any questions, send me a message! Where do you get smooth moves music from? WARIO WARE IS MY FAVORITE SERIES, but Toad is still #1!!! Jeez, Sonic_Luigi15.... You EVER played a warioware? Is this your first time? To answer everyone's questions about where I got the sounds, I ripped them myself from YouTube movies using a program called Audacity. Short but sweet. My favourite is the rock dropping microgame. Keep it up. Hey, Nintendo, this is the next WarioWare! Nice job Toodles team! This is really well done! I'm gonna have fun playing this! Keep it up!